The Calais Seaways, formally known as the Norman Spirit, is used on the popular Dover Calais route. There’s plenty to keep you occupied during the short channel ferry crossing with a range of venues to shop, eat and drink, as well as comfortable seating to unwind in. You’ll also find extensive outside decks, a children’s play area, internet access and a games arcade. After a recent refurbishment the ship is now better than ever. Passengers can benefit from renovated restaurants, lounges, new look public areas and make use of the free Wi-Fi facilities. The vessel can carry up to 2000 voyagers, 600 vehicles whilst reaching speeds of 21 knots. For those who want a little extra luxury whilst they are on the move, there’s the option of comfortable seating, sea views and complimentary food and drink in the Premium Lounge. The private lounge area comes with Prosecco on arrival, newspapers, TV, hot and cold beverages and fruit, pastries and sweet treats included. 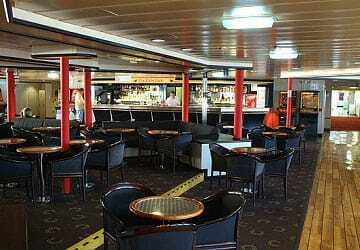 For those who don’t want the upgrade, there are plenty of seating areas and tables located throughout the ship. The Seven Seas Restaurant has been recently renovated to a very high standard and offers a great range of culinary choices. It’ll suit varying tastes and pockets. There is also the newly rebranded Lighthouse Café that ensures you aren’t short of choices for a little bite to eat and hot and cold drinks. All palates are catered for in the self-service restaurant with a choice of meal deals and specialised menus tailored to children and vegetarians. A selection of bars are scattered throughout the decks so you don’t have to go thirsty while you’re aboard. 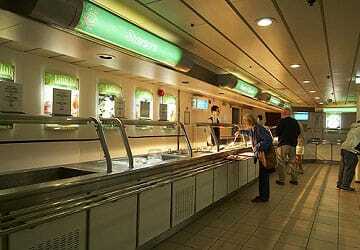 After a refit the ship provides a designated freight drivers restaurant. If you are in need of some last minute holiday essentials, fancy something to read, want to buy souvenirs for loved ones or simply want to treat yourself to some retail therapy, there are plenty of shopping options on board. 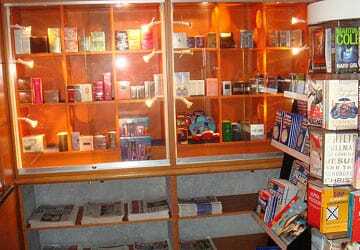 Whilst aboard you can benefit from lower than high street prices on a range of cosmetics, fragrances and fashion items. There is no need to lose contact with family and friends, fall behind on work or lose track of the latest news when on board this DFDS ship. Every passenger can stay connected with the free Wi-Fi provided throughout the decks. The designated freight drivers area has been revamped and includes brand new shower facilities, allowing you to freshen up after a long and arduous day on the European roads. A new hospital and first aid area is available on the ferry if you do have the misfortune to feel unwell or have an accident when travelling. A designated Children’s Area is provided to allow the younger voyagers to run around and enjoy themselves whilst riding the waves to their destination. Accessibility is a priority for this operator and a number of measures have been implemented to ensure every passenger has the smoothest of journeys. There is a passenger lift which travels between all public deck areas and also a wheelchair accessible toilet available. The bathroom are equipped with shower, wash basin, WC & hand rails adapted for travellers with restricted abilities. Lift access parking is also provided. Please Note: Whilst we have taken great care in making our Calais Seaways guide as accurate as possible, onboard facilities, services and entertainment may vary depending on the date and time of year that you travel, facilities mentioned may change without notification and ferry companies reserve the right to operate vessels other than those mentioned at time of booking without prior notification. 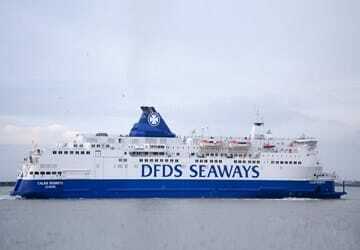 We book with DFDS always. They run on time. The staff are all polite and helpful. Also because we travel upwards of three hundred miles either way to get to the ferry ports timing can often be difficult. DFDS cater for this by allowing a free ferry before or after the alloted boo kind. There are very flexible. We arrived an hour early for our booked ferry and we were able to board an earlier ferry with only minutes to spare. This was wonderful, no waiting around at all. The ferry staff are welcoming and the facilities were clean and comfortable. Very good. Left on time and arrived on time. A pleasant crossing. Good trip all round.The ferry was on time it was a nice clean ship good amenities and a nice smooth crossing. Very nice journey seat were comfortable and everything I wanted was on board. Online booking service made arrival at the port quick and easy. Very good service. We arrived quite late but still allowed us to board the ferry. Nice and straight forward, lots of places to sit and a nice little cafe to eat and drink. Friendly staff and a shop that has most things. Great trip. The sailing was perfect. Very good boats both ways and good times. The return trip was being refurbished but it did not spoil the experience. Would recommend and use again. The only fault if any is that there is no thought for cars with dogs. Example parking to one side of the boat so the dog does not get too disturbed by other car passengers and can relax better. We actually set out 30 mins early - the previous boat was delayed, so DFDS efficiently and seamlessly moved us onto it before it left. Great fish and chips on board. Boat is small but well layed out, with plenty of comfortable seating. The only thing missing for me was some quality french produce in the shop - but if all you want is a quick and easy crossing, DFDS does the job. Trip was CADO on Dec 24 and return on Jan 3. Neither ferry was crowded. Service on time and friendly. Would book again. We found this ferry quite enjoyable, mainly because it was on time, the garage staff were friendly, the ferry was clean and warm (it was freezing outside) the choice of food and drinks was very good and our seating was comfortable. Thank you. The trip was very easy. The staff are very welcoming, coffee and croissants are good. wifi is free too. "Very pleasant trip across. Will certainly use again. " Staff were friendly and most helpful. Smooth crossing. Ship comfortable. As usual a great trip comfortable, you can stretch your legs and relax. No complaint's, smooth sailing ! We were put on an earlier boat without any fuss, the trip was on time and very reasonably priced. No todo about passwords etc. Staff on board polite and helpful. I shall use the service again.